What an incredible combination; a warm summer day, an energetic, inquisitive grandson and a mountain destination steeped in history. 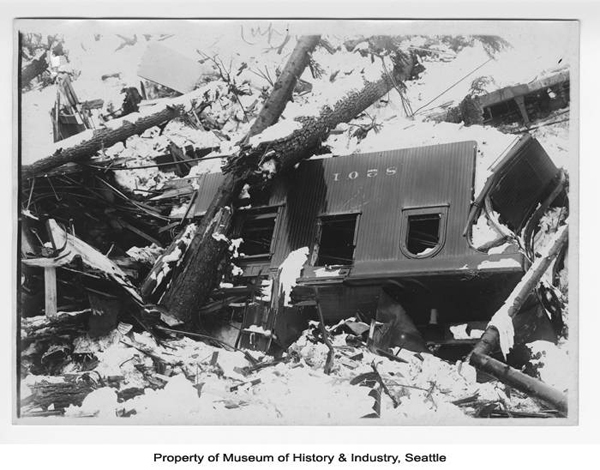 In 2009 grandson Cameron first heard the story of the 1910 Wellington disaster, a winter snow slide that crushed a passenger train near Stevens Pass, taking nearly one hundred lives. 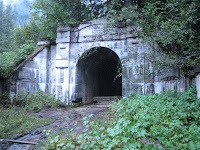 The most dangerous section of rail line was later abandoned and in 2000 reopened as the Iron Goat Trail. Cameron was determined to hike that trail. A combination of snow and temperature conditions combined to bring down a colossal slide the night of March 1st. The idle train was swept from the tracks and crushed on the slope below. With tracks still blocked rescue crews had to climb a steep slope at Windy Point and hike three miles on the still dangerous and snow covered track to reach to accident site. News of the Wellington disaster swept the country. The rail company later changed the name of Wellington to “Tyee” so the name would not appear on future timetables. But the new name didn’t “stick” and the name “Wellington” survives to this day. More and stronger concrete snowsheds were constructed to protect the route. 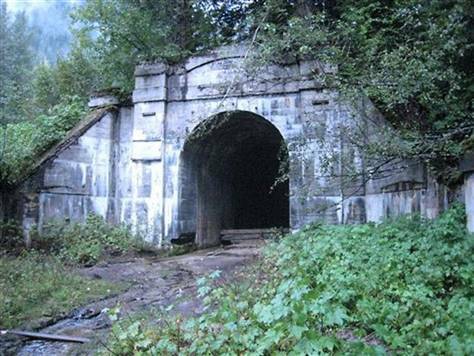 In 1929 a new longer tunnel was constructed at a lower elevation and this stretch of rail was abandoned. For further reading on the disaster read “America’s Worst Train Disaster” by Don Moody. 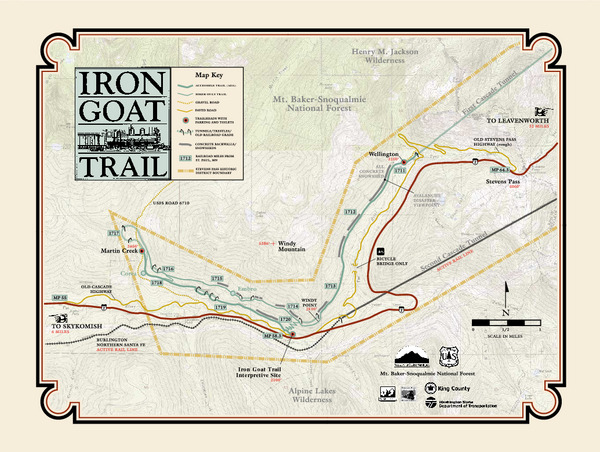 Info on the history and the trail is available at an Iron Goat website. The entire trail is about nine miles long. However, with its winding route, shorter segments offer variety for those with limited time or energy. Mile markers on the trail indicate the distance from the Great Northern Railroad headquarters in Minnesota. The east end of the trail is mile 1711 and the west is 1720. A permit is required to park at any of the three trailheads and can be obtained at the Forest Service office one mile east of Skykomish on Highway 2. When we saw how well the parking, restrooms, interpretive signs and trail was maintained we didn’t mind supporting the permit system. Cameron selected the east, or Wellington end, as our starting point. It was reached by turning north, off of highway 2, at highway milepost 64.3 just short of the Stevens Pass summit. Eastbound the left turn can be dangerous so we proceeded on to the summit, turned around and headed back west, making a right turn. After about three miles on the semi paved road a right turn onto a gravel road took us to the trailhead. Four wheel drive is not required. First we headed east, about 200 yards, to the mouth of the first Cascade Tunnel, completed in 1900. For safety reasons hikers are not allowed in the tunnel and a washout had destroyed the final portion of the trail to the mouth, but we could see the tunnel and make it our official starting point. Returning to the parking area we began the main trail down the mountain. Huge concrete snowsheds, constructed after 1910, frame portions of the trail. Trail makers identify the features of the old town of Wellington though no buildings and few relics remain. An occasional rusty pully or concrete foundation are all that remain. One trail lookout jutted over the slope where the tragic slide took place. It looked very benign on a warm summer day. We could have walked about three miles to Windy Point but, instead, covered about 1.5 miles before returning to the parking area. We used the available picnic tables for lunch and then drove back to the highway and to back down to highway milepost 58.3 and the location of the Iron Goat Trail Interpretive Site, the westerly trailhead head. There we faced two choices. First we could follow the old rail line 3 miles west to the Martin Creek trailhead where a switchback turned the line east again for another 3 miles to Windy Point; six miles total. Second, we could follow the path of the rescue workings and head straight up the slope to intersect the line at Windy Point. The trail climbs 700 vertical feet in one mile. Never one to shirk a challenge Cameron chose the climb and grandpa, panting, followed behind. Arriving at Windy point we headed east toward Wellington for a short time and then turned, returned to Windy point and began the six mile trail back to the start, via the Martin Creek trailhead. But, it was too late in the day for us to begin a six mile hike so we aborted and turned around. The trail, with its tunnels and history looked very interesting and well worth a return trip. Back at Windy Point we took the shortcut back down to the car finding (surprise, surprise) that going down is much easier than going up! Reflection on the Iron Goat Trail: This is a wonderful trail for hikers of all skill levels. Since it is an old rail line none of the grades are steep, the shortcut up to Windy Point being the exception. Because there are several trail access points segments of the trail can be covered. With two or more cars shuttling drivers back and forth a one way hike could be arranged. One family left a car at the interpretive site and then started their hike in Wellington. Wellington to Windy point, 3 miles, plus the mile down the short cut gave them a nice one way four mile trip. The scenery is magnificent, the history is refreshed with well executed trail side signs. So find yourself an enthusiastic grandchild and take a hike. Steve is the author of two novels, "The Girl With the Cinnamon Twist" and "Simone," He writes freelance and likes to ski, kayak, cycle and spend time with his grandkids. In addition to writing he devotes time to working as a mediator and serving on several for-profit and non-profit boards. His writing has covered a range of topics including travel, history and retirement living.